From left to right, Stanley, mine, original Veritas totes. A lot of thought, time, and independent testing went into the design of my replacement tote for the Veritas handplanes. The photo above shows a comparison of the veritable Stanley tote to my Veritas replacement tote, and the original Veritas tote as seen on my bevel up jack plane. As you can see the Veritas tote is taller. That is because there is no frog on which to point your index finger. Therefore, the tote must accommodate 4 fingers instead of the usual 3 fingers. If you have a Veritas plane and are unhappy with the original tote visit my website for more information on my replacement knob and tote sets for the Veritas, and other, planes. As always, thanks for stopping by and feel free to leave a comment. 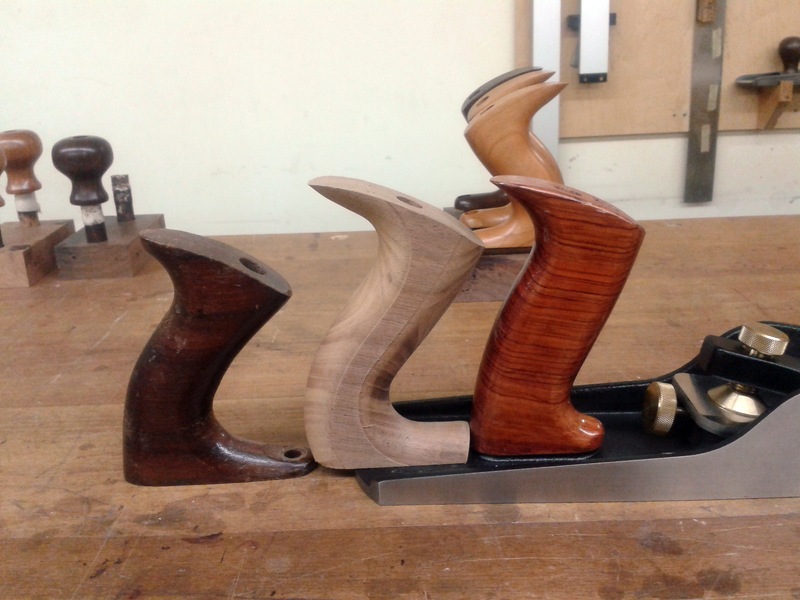 This entry was posted in Woodworking Hand Tools and tagged plane handle, plane tote, veritas handle, Veritas tote. Bookmark the permalink. Thanks Rob. BTW I like the way you handled the readers question about your safe use of the table saw in the magazine. I’ve a blog as well, and I think I need to improve the given information I have on the website. Anyways, I needed to go with you on your just blog.